I love walking big European cities. The architecture is always beautiful and there's never a shortage of things to see and do. Drop me down in Berlin, Paris, Amsterdam or Dublin and let me walk! There is one negative thing about walking big European cities. It's often very difficult to find a free public washroom. The picture I took below is an example of a public washroom in Amsterdam. They wanted a Euro to enter. You're using the wrong ones Mike! I found them to be way cleaner. One toilet even wiped down the seat after you used it. It rotated the seat and wiped it with disinfectant. Mike, where are you when you took this picture? It's actually in the shopping district near the flower market here in Amsterdam. @Sauga Phil, I agree. In an arena or stadium where you paid you ticket and you can't really leave, that would be wrong. But I don't mind paying if it's in public place. I always buy something if I walk in a fast food or coffee shop to use their bathroom. I just think it's bad form to go pop in and pop out (yes I said "pop" lol) without buying something. Describe your last poop using a movie name. Just returned from a Baltic cruise. 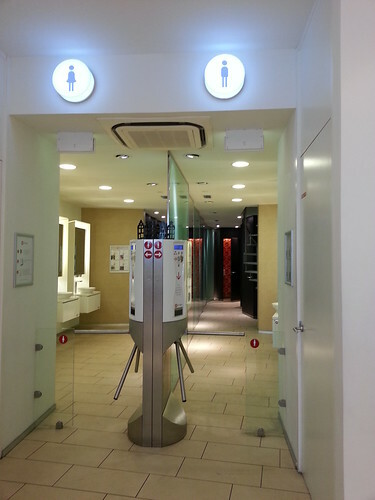 Had no problem with washrooms.............shopping areas had freebies. However, for a Euro, if I was desperate, would gladly pay. Most basic, but clean. Not a fan of the pay washrooms. I was in the train station in Venice last year desperately needing a washroom before going on the train. Didn't have the correct change and had to buy something I didn't want to get change to go to the bathroom. That's just...not ok in my books. It was a Scotsman that invented the limbo dance. He was trying to get under the door of a pay toliet!